While creating the new administration stack in IIS 7, we were looking into the different ways users could manipulate the server configuration as well as the new runtime information available in IIS 7 (Internally we call this RSCA-Runtime State and Control API) from managed code, and we realized we needed to provide a simpler and more straight forward API that developers could consume from managed code. Microsoft.Web.Administration is the answer to this problem. This API is designed to be simple to code against in an “intellisense-driven” sort of way. At the root level a class called ServerManager exposes all the functionality you will need. To show the power and simplicity of this API, let’s look at some samples below. To try this samples just create a new Console Application in Visual Studio and add a reference to Microsoft.Web.Administration.dll that can be found at IIS directory (%WinDir%\System32\InetSrv). Please note that the following code is based on Windows Vista Beta 2 code and will likely change for the release candidate versions of Windows Vista since we have planned several enhancements to simplify the API and expose more features into it. 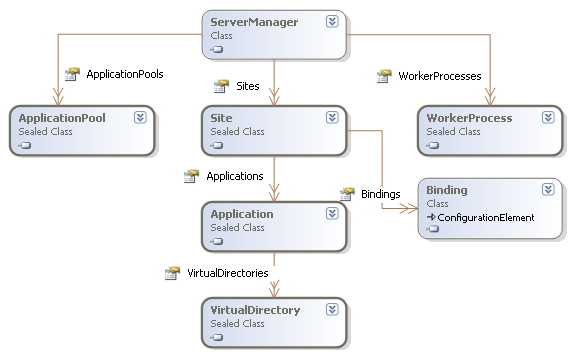 The following picture shows the main objects (excluding Configuration related classes). This basically creates an instance of the ServerManager class and uses the Add method in the Sites collection to create a new site named "NewSite" listening at port 8080 using http protocol and content files are at d:\MySite. One thing to note is that calling Update is a requirement since that is the moment when we persist the changes to the configuration store. This sample uses the Sites collection Indexer to get NewSite site and uses the Applications collection to add a new http://localhost:8080/Sales application. Another big thing on this API is the ability to edit the “.config” files using a simple API, this includes the ability of modifying the main applicationHost.config file from IIS, web.config files from asp.net as well as machine.config and other config files (such as administration.config). However I will talk about them in a future post. That might possibly be the coolest thing I’ve ever seen IIS do. Its Wonderful and very cool. special thanks to Mr. carlos, Microsoft and Microsoft communities. Waauuu, we will be saving so many lines of code and using this extensive. Does this modify the (what used to be) metabase? When dealing with several web servers in a cluster, will I still need to sync the metabases (or .config files) across nodes, or can I finally centralize all this on a NAS via UNC? Mark – IIS7 does not use the metabase to store configuration. It is totally within .config files. There is a Legacy ABO Compatibility component (completely optional, but installed by default) which you can install to capture all legacy API calls to configure the metabase and transparently translate it into .config settings. You will still need to synchronize config settings across servers in a cluster, though if you run the same command remotely it’d do the same. I have yet to understand the need to have IIS read configuration from a UNC share vs ability to copy the same IIS configuration to multiple machines. They accomplish the same objective; you can view one as a local-cached version of the other. Central UNC share sounds cooler but is more fragile, so why??? In other words, suppose you get what you want — the "centralized" config file on NAS via UNC. All that means is that after IIS calls CreateFile to get a handle to the file, read/write to the file can now RANDOMLY fail as IIS works with various sections of the file (and underneath the scenes, network traffic is getting used to fulfill the read/write). What should IIS do? Bail on first error? Bail after retrying 5 times in 5 seconds (but suppose you are modifying config — where do they go)? Cache the change locally and periodically propagate back to the UNC (but explain how this is any better than IIS reading local .config file and a separate "syncing" service periodically syncing changes between multiple locations? In other words — please explain your real scenario and requirements, not how you think we should implement things. Say, for example, you have several IIS nodes behind a load balancer. Then, you expose a user-facing control panel application that modifies the metabase for a feature like Application Roots, for example. This requires the replication of the "master" metabase (the one where the control panel made the change) to all the "slave" IIS nodes. This can’t occur realtime because of the sheer volume of updates occurring to the metabase. So, you have to replicate on a schedule – say, every 5 minutes. What a NAS/UNC based configuration store (metabase) buys you is a way out of the replication scenario. However, there still exists the random fail issue as you described. Ideally, I’d like to see a realtime replication method similar to Active Directory. Here, there are multiple peer nodes, where any change is replicated to the other nodes. Maybe this can be accomplished via a pure in-memory database with replication via two-phase commit across IIS nodes. Maybe a heartbeat service between IIS nodes? Just brainstorming here. Can you create AppPools with the new interface? How about adding a "re-read config files" function to allow central config storage and after editing the config, telling each machine to re-read the file to flush the servers internal cache? Not a bad idea, considering change notification doesnt work on metabase.xml. Yes you can create application pools as well as enumerate, remove them and even recycle them. Can this be used to manage remote IIS servers within the same AD group? Thanks for your reply Carlos. Do you know where I can find some ‘good’ documentation on this? Also is there anyway to control FTP settings for a Site? When using FTP 7.0 with IIS 7.0 and using Microsoft.Web.Administration how do add ftp settings to a web site? Or do I have to manually edit the .config files xml to add it? If not supported, would this feature be supported in future? You can absolutely use Microsoft.Web.Administration for that, however you will either need to use the loosely typed model (ConfigurationSection, ConfigurationElement, etc) or you will need to create your own strongly typed classes for it. And then use that for anything you need, also FTP defines several sections as well that you can use GetSection() over a Configuration object. Will this all be exposed to the (VB) scripting engine? How do I query the current memory usage of a Site? now tell me a solution when I can create a virtual directory without being admin to windows Vista. For security reasons you cannot add a virtual directory unless you are an administrator. You can imagine that if a non-administrator was able to expose a random directory over the URL namespace of the site would be a bad idea. Can we use the Microsoft.Web.Administration from a Windows Server 2008 to remotely manage IIS 6 running on Windows Server 2003? Where is the Microsoft.Web.Administration located? Is it part of .Net or Windows? Unfortunately you can only use it to manage a Windows Vista, Windows Server 2008, Windows 7, and Windows Server 2008 R2 server. It is not distributed with .net but instead is part of IIS. Are they any major changes to the Microsoft.Web.Administration API’s in IIS 7.5? I am using VS2008 on an XP machine and cannot see the Microsoft.Web.Administration namespace. I guess this is because it is part of IIS7, which is not on the development machine. The finished code is to run on an IIS 7 server. I’d like to create a reference but don’t know where to find one. Can anyone help please? Just wondering, How would one go about using this API to both View and Modify the contents of the IPGrant and/or Deny Table? Could you be so kind as to give an explanation or hint? How do I get TARGETSITE (id for the website ) programmetically? Thx For example, get ID for MyWebSite? Would love to be able to get code to delete 2 virtual directories/applications then check to see if application pool has any other apps assigned to it. If not, delete the app Pool. I'm trying to create a virtual directory using C#. When try to add a reference to Microsoft.Web.Administration Namespace I can't find it in the list. Any clue? How can I using Microsoft.Web.Administration in my asp.net web site. I want create a web page to manager the iis. i want a vb code that can query the iis metadata to give the list of site that has browsing directory enabled status .can anyone provide it??? to the file … do you perhaps have a solution? I had tried the below to no avail.